Drug addiction recovery. Does rehab really work? Finding the right rehab center can be a challenging task. With a wide variety of rehabs to choose from, finding the one that suits your particular needs can be a daunting undertaking. There is no generic program of care that should be applied to all patients. An addict seeking treatment should visit potential facilities and meet with the staff to make sure they will be a good fit. Other than buying a home or a car, attending a rehab center is one of the most important investments a person can make. They should research what specialties each facility has. The five things listed below should be considered when searching for the right rehab center. 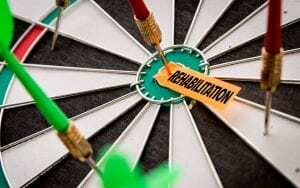 One: What Is The Rehab’s Success Rate? The ultimate goal of attending rehab is to attain long-term sobriety. So it’s important to research the success rate of the rehab center, to see how effective their programs of care are. The success rate for the particular addiction the patient is seeking treatment for should be researched in particular. Does the rehab center provide proper aftercare, and what is their detox program like? These are two questions to answer when finding the right rehab center, since both are crucial parts of recovery. Two: Are They Properly Accredited And Licensed? Most importantly, research the credentials of the staff and facility. An accredited facility is more qualified to provide effective treatment. And research the education of the staff, that they have legitimate training and are capable of treating your specific issues. Since you want this treatment to be life-long, the professionals who are treating you should be highly qualified in the specific treatment that you need for a successful recovery. Three: Do They Offer Financing Options? Most people will need some sort of financing options to attend rehab. It’s important to make sure that the rehab center has financing options that will enable you to get the treatment that you need. Find out if they accept insurance or offer any financial assistance. Request a tour of the facilities. It’s important that the client sees where he could potentially be staying. He will be undergoing life-changing treatment within this facility, so it’s important that he feels comfortable and safe within the environment. This is a good time to meet the staff and see if you feel comfortable talking with them about painful issues. This will be a big factor in deciding what facility is best for you. Five: How Personalized Is The Treatment? No two patients are the same, and no one wants to be treated like just another generic number. It’s important to research how individualized the rehab center’s program of care is. Will there be a program of care specifically tailored to your needs? If a rehab facility has the resources and the staff that can provide personalized treatment that will be a huge feature in their favor. Some patients might want holistic treatments, and that may be a deciding factor. Others may need dual diagnosis treatment, because they suffer from another issue besides drug addiction. These are all individual needs that should be considered. At Seasons In Malibu, families are included in the treatment, which is a unique program of care that greatly increases the chances of successful recovery. After doing this research, an addict should be in good shape to make an informed decision about where to attend rehab. If a rehab center offers a personalized program of care, financing options, and comfortable facilities, then it should be a strong candidate to provide effective treatment. Ultimately, the patient should go to a rehab center confident that it’s the beginning of a new and sober life. Malibu, California is known mostly as the playground for the rich and famous. For people who dream of living near the beach and the lifestyle that comes with being part an affluent beach community, Malibu is like a dream come true. North of Los Angeles County, Malibu is the home of many celebrities who seek tranquility. This scenic environment is also home to several world-class rehab facilities. Malibu, with the water and miles of beach, is a beautiful place for someone to seek to escape the temptations and addictions of his normal life. Rehab centers in Malibu often make news because of the celebrities who get treated there like Lindsay Lohan, but the benefits of rehab in Malibu go way beyond the surface. Three unique benefits are listed below. One reason why many people don’t want to attend alcohol rehab, is that they feel like they will be going to a cold and sterile environment, lacking in any warmth. This expectation, a long with leaving familiar surroundings, can be a great source of stress for those seeking treatment. A long with treatment from an exemplary staff, Seasons in Malibu provides the services and warm, friendly environment that makes staying in rehab a calming and spiritually rebuilding experience. Alcohol rehabilitation involves treating the mind, body, and spirit. The benefits of outdoor activities cannot be overstated, when it comes to the healing effects they have on someone recovering from addiction. Recovering addicts are weakened in mind and spirit, and need to rebuild themselves mentally, physically, and spiritually. Outdoor activities assist greatly in rebuilding all three parts of a human being. All of these activities can be done on a regular basis, and are available because of the treatment center being located in beautiful Malibu. California is home to the entertainment industry, which unfortunately is an industry that deals with its fair share of alcohol addiction. However, due to this, California is also home to the most cutting-edge treatments and programs of care when it comes to overcoming addiction. A testament to this is the eighty five percent success rate that Seasons In Malibu boasts in successfully rehabilitating its patients. Programs of care like The Seasons Systemic Family Treatment Program are offered, which recognizes to truly rehabilitate an individual, the relationship he has with his family needs to be repaired. Treatments for co-occurring disorders are also offered. Since many times alcohol addiction occurs alongside other emotional issues such as anxiety or depression, treatments of care are set in place to treat these issues. Seasons in Malibu is truly qualified to treat patients with co-occurring disorders, which requires a very skilled group of professionals to provide effective treatment. Overall, rehab in Malibu offers an experience that can’t be found anywhere else. This includes being surrounded by water and nature, a wide range of stimulating activities, and the most cutting-edge treatments that have an eighty-five percent success rate. What an individual can expect in rehab when they check in here at Seasons in Malibu is that we get people of all ages, all walks of life; some have been in multiple drug and alcohol rehab centers or 12-step programs: they’ve tried everything, whereas some have never been in a program, and they’re here trying to heal for the very first time. What everyone here can expect is to be treated like a human being, to be treated with a lot of nurturing, and love, and support, and positive energy. We leave the shame, the blame—all of those labels—at the door. We’re all about getting back in touch with the person’s core spirit of who they are. There are several things that sets Seasons Malibu apart from other treatment centers. There are two most primary things are the number of one to one sessions that a client will get here which can be up to fifteen, sixteen individual sessions a week, in addition to all the group that they get. So there is a big emphasis on having that individual private one to one time to do the work that they need do. The second thing that really sets us apart from other treatment centers is the focus on the family work. There is a big emphasis on getting the families involved here. Which we see as really important because the primary reason for why people relapse when they leave treatment is the kinds of family conflict, the dis function that goes on. So when we can treat that here, they have a much better chance of being successful when they go back out into the community. I’ve been in the business about 15 years now, and I’ve worked in a lot of different clinics, and a lot of different charity settings, and in private practice as well. I’ve got to say, the staff here is so cohesive. Really, really even; they meet everybody on their path and there’s mutual respect. It’s a wonderful, wonderful team effort, here. It’s a beautiful thing. I’m very happy, very proud to be a part of this team. The staff here at Seasons Malibu are probably the highest quality that you are going to get anywhere in the world. We pride ourselves in having a high level and high profile treatment program that really addresses the credential providers that have access to the evidence-based cutting edge programs, as well as holistic services that clients really strive and benefit from. So our real credentialed individuals and practitioners here are of the highest standards that you could expect from any treatment program, such as this one. So from medical doctors to PhD level to SciD level, no candidate that you come across that you work with will have less than a Master’s Degree. One of the most valuable assets that the patients bring with them when they finish our Malibu drug rehab treatment and return to their community is a very detailed exit plan. There is a lot of work that goes in, from the day that they first get here, to detail out what their exit plan will be: What kind of support systems are out there, where the meetings are that they are going to go to, what they are going to do about a career change, what they are going to do about recreation, and how they are going to maintain their sub-ride in a real specific way. Another aspect of what they get while they are here is the opportunity to do in-depth psychological testing, so that diagnoses can be clarified, medications can be appropriate, and various kinds of treatments for those kinds of diagnoses can be implemented. They can take all this information with them when they leave, and present it to their outpatient therapist and have a very comprehensive view of what has been troubling them all these years.